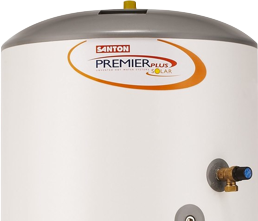 Water Softeners & Megaflo Units..
Well, they can be a bloody nuisance to say the least. 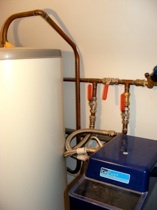 However, if the plumbing system has been designed properly, and the water softener units have been specified correctly, there’s no reason why they shouldn’t make a happy marriage. However, they can throw up all sorts of weird and wonderful faults, that can be VERY time consuming to track down. 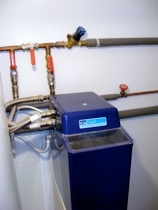 These are typical water softener arrangements. Make sure your softener has the correct (extra volume hoses) installed. 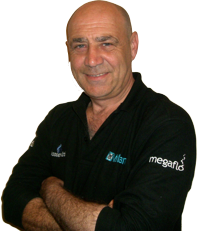 This is a Megaflo Chris attended to recently. The complaint was lack of water flow. 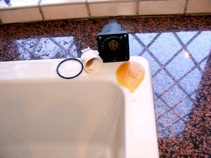 After checking pressures, and flow rates, eventually the Combination valve was removed to find it was full of resin produced as a by-product of the water softener. This would’ve caused untold damage, if it had impregnated the whole system causing a nightmare with all the taps and thermostatic mixer valves. 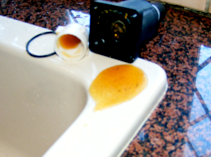 Luckily, the built-in filter in the Combination valve did it’s job, and protected the rest of the system.. In response to concerns about ‘rogue traders’ which are often highlighted in the media, a partnership of Local Authority Trading Standards Offices have taken the groundbreaking step of putting together the Buy With Confidence Scheme. The scheme provides a list of local businesses which have given their commitment to trading fairly. Each business listed has undergone a series of rigorous checks and audits before being approved as a member of the scheme.